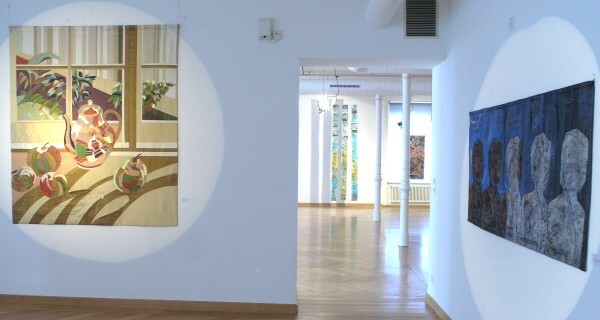 Cooperation with the Museum Max Berk, "Kurpfälzisches Museum der Stadt Heidelberg"
The works chosen for the European Quilt Triennial are on show in the St.Gallen Textile Museumfor the fourth time. This exhibition, which is organised by the Max Berk Textile Collection in Heidelberg-Ziegelhausen, has meanwhile become a guarantee of high artistic standards at an international level. The exhibition consists of 47 nominated works from 14 nations. A seven-member jury selected the quilts from among 228 applications. 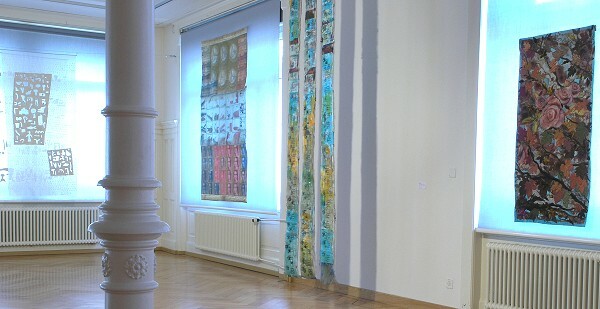 Three works by jurors, which are shown in addition, complement the representative overview of the European quilt scene. The selected works are characterised by a particularly skilled deployment of materials, techniques and subjects. The impression created by the imagery of the quilts is predominantly serene and solemn, with accents provided by strong and luminous colours. With their use of new materials, the works reveal the artists courage to be innovative. A majority of the selected themes refer to nature. Another clear focus is on works concerned with the human environment. This is followed by personal subjects, and subjects dealing with social or historical aspects. Only a few quilts are exclusively devoted to formal aspects of design. In the overall context they are an attractive complement to the other works. At this Triennial, two prizes that are equal in status but differ in terms of subject-matter were awarded for the first time. In both cases, the prize money was EUR 1000. The Prize for Large-Format Innovation went to the Italian artist, Mariana Frühauf. Her three-metre-high, three-dimensional quilt entitled Remove is modelled on stripped tree bark. The Prize for Innovation in Quilting was awarded to the English artist, Olga Norris. The significance of the message that her impressive work entitled The yellow room: resignation conveys is reinforced by hand-quilting. The great Doris Winter Memorial Award worth EUR 5000 was this year funded by the Betty Barclay Group and, in particular, by Jürgen H. Winter. This prize, which is awarded for special innovation in the fields of materials, technique and design, was awarded to the Dutch artist, Mirjam Pet-Jacobs, for her work entitled Timeless in time. This artist was the first quilter to integrate a DVD installation in her work, which consists of three separate textile layers with a film being projected through two transparent organza fabrics onto a white, quilted surface in the background. The film shows the time-consuming creative process involving manual and machine work. This labour-intensive production lasting endless hours is accompanied by chanting sounds reminiscent of prayer wheels. After 25 years of constant development, the quilt scene has reached a very high standard, from where it is difficult to break into new territory. However, Mirjam Pet-Jacobs award-winning video installation shows one way in which this can be done. This work treats the theme of quilting with its accompanying expense of time and work, thus putting an end to the outsider status that quilters are usually encumbered with in the art world. Timeless in time  the title of the main award  may also be considered a metaphor for this 4th European Quilt Triennial: for the slow, steady change in the standards to be aspired to by quilting.